The pictures of tooth decay caused by carbonated beverages are TOO HORRIBLE to post here. Carbonated drinks, whether diet or not, can cause tooth decay because they contain carbonic acid. This is the ingredient in the “fizz.” Plain soda water, Perrier, Diet Coke, etc. 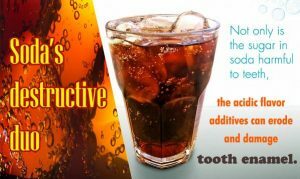 all have the potential to cause tooth decay if over used. I once had a patient who had 14 cavities and beautiful oral hygiene. She brushed and flossed regularly. After she stopped drinking Perrier, she had no more cavities for 15 years. Recently, I had a 39 year-old female present with a dentition that was badly eroded by some type of acid. It was so bad that it had changed her bite and the teeth no longer touched like they had for years. We discussed over ingestion of citrus or acid reflux. One dentist had suggested that she was bulimic. Towards the end of the examination she mentioned that she had a “soda machine” at home. During her last pregnancy, plain soda water had helped greatly with morning sickness. She kept drinking it after the pregnancy. Her child in now 4 years old. She never knew had much acid was in the carbonation. Now, her mouth has to be re-built. Call 714-847-9900 to set up a consultation or schedule an appointment with our dental hygienist.